A Podcast about motor scooters for those who dream about scooting and for veteran scooter enthusiasts with a passion for any scooter including a classic or new Vespa a Lambretta or a new twist n go scoot. 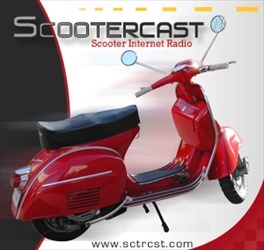 The show includes commentary on new scooters classic scooters scooter clubs web and internet scooter resources scooter shops and rallies and includes provocative conversations with scooter experts in the mechanical arena riding and accessories. Listeners are invited to share their opinions interests and passion through email and recorded listener comments. A Podcast about motor scooters for those who dream about scooting and veteran scooter enthusiasts with a passion for any scooter including a classic or new Vespa a Lambretta or a new twist n go scoot. The show includes commentary on new scooters classic scooters scooter clubs web and internet resources scooter shops and rallies and includes provocative conversations with scooter experts in the mechanical arena and riding. Listeners are invited to share their opinions interests and passion through email and recorded listener comments.